Barwell’s Commercial Director, Chris Needell, is being very cagey about who has purchased this DBR9, but the new owner wishes to see it race in the FIA GT Championship next year, which fits in very neatly with the team’s GT3 programme. So it’s GT1 and GT3 for the team in the new year. The team isn’t committing to a full FIA GT1 programme yet, but that would be the ideal scenario. The car owner also has ambitions to see this chassis racing at Le Mans in 2008. The DBR9 is currently being rebuilt by Aston Martin Racing / Prodrive, and is actually the spare car from the 2006 Aston Martin Racing ALMS campaign. Two of the three cars in North America are back in Europe – leaving one still in the US. 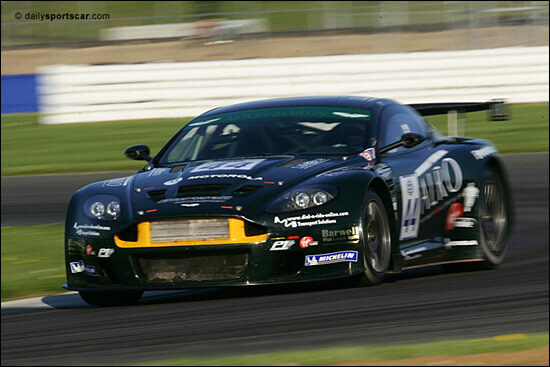 The Barwell GT1 Aston Martin will be on display at the Autosport Show next month, while one of the team’s GT3 cars will also be present at the NEC, this one on the Autocar stand. First task after the show will be two days of testing at Guadix in Spain. Aston Martin Racing Commercial Director, James Turner is “so pleased that Barwell has managed to structure this deal for next year, it is a fitting reward for their success this year with our DBRS9 cars. I wish them both every success next season." “We can tailor-make a smaller programme (than a full FIA GT season) to suit drivers’ budgets if required,” says Chris Needell. Below is one of the team's GT3 cars, on their debut at Silverstone back in May.